In any given article in a health and beauty magazine about “losing weight fast” or “how to drop 10 pounds in 10 days,” often times I see “stop eating late at night” on the list. I was always confused by this, because I always assumed eating at night is equal to eating a meal during the day time. It’s not like eating at night causes you to inhale double the calories as you normally would, so what’s all the fuss about? Is eating at night as bad as we think it is? And what makes it different from eating any other meal in the day? According to womenshealthmag.com Jaime Mass, a nutritionist, simply states that a calorie is just a calorie, no matter what time of day you consume them. She further states that it doesn’t matter what time of day you eat food, because if you are consuming more calories than you are burning, you will gain weight regardless of the time of day you eat food. However, usnews.com states that research has shown that people who eat food at night consistently are heavier on average than people who do not eat at night. One study, conducted by The American Journal of of Clinical Nutrition, came to the conclusion that, people who ate between 11 pm and 5 am gained more weight than those who did not eat during those times. The article does not give the specifics of the study however, and a lot of different confounding, or third variables, could contribute to weight gain at night. For example, in the study were the participants all males, or all females? Or a mixture of both? Men and women gain weight differently, so the study would have to be clear of the sexes of the participants for an accurate study. Another confounding variable could be the kind of food you are eating. A fattier food like a hamburger or pizza slice would cause you to intake more calories than if you were eating an apple or a slice of bread with peanut butter on it. The study was not very clear of what the participants were eating, so I am unable to decide if I should trust everything it is saying. Before I came to any conclusions myself, I would conduct a study of my own before I decided for myself if eating at night was bad or not. I would think to myself the direct causality and the reverse causality of the hypothesis at hand. Does eating at night cause weight, or does weight can cause you to eat at night? Or, is a confounding or third variable causing it. Of course, chance could also be a factor too. I think any of the four options could be a viable solution to this question. So, I think the answer to the question is unresolved now. I think more research is required to be conducted for us to come to a solution. As a sc200 student, I would understand that the correlation does not exactly equal causation, and that more research is required before I will come to a logical solution about eating at night or not. This entry was posted in Uncategorized on September 15, 2016 by Christina Rae Locurto. I too have a bad habit of eating late at night. I think that there may be a psychological explanation as to why eating at night may lead to weight gain. In general, humans are very social creatures- and we care a lot about what others think of us. Midnight snacks take place in an isolated situation. Could it be that we tend to overeat when no one is watching? Even if we don’t realize it, the privacy of the night may lead to an increase in indulgence. Obviously, studies that control for calories consumed would disprove this theory but I believe that a lot of anecdotes can be explained by this. I always heard that eatings late at night is bad for you and leads to weight gain. And I so agree that it doesn’t seem to make sense, why would eating at a later time have a different affect on your body than an earlier time? I think that being a college student is a big contributor to eating so late at night. After going got classes all day, doing homework, studying, and everything else college students do, it is hard to keep set schedule for eating. Just last night I didn’t eat dinner until 10 pm because I was to busy to eat any earlier. I don’t know about anyone else but sometimes I like to enjoy a nice little midnight snack if I have a lot of work to do or if i just can’t sleep. Since there is no final conclusion on this topic, here are some yummy midnight snack recipes to enjoy. As an avid midnight snacker, I was immediately drawn to this post. It’s almost a routine for me to wake up in the middle of the night and eat a tiny snack (a granola bar, an apple, a bowl of popcorn). Throughout the years, I’ve noticed that whenever I late night snack I don’t feel the need to eat a big breakfast in the morning- which is good because it saves me time, meaning I can sleep more and still get to class on time. However, if I sleep through the night and don’t snack, I’ll wake up the next morning with intense hunger pains, as if I hadn’t eaten at all the day before. I think I’ve accustomed my body into considering late night snacks as part of my regular daily routine. It’s weird to read that it might cause weight gain because I’ve never personally noticed a difference between when I late night snack/ when I don’t. I found this article (https://experiencelife.com/article/the-hidden-causes-of-late-night-snacking/) interesting because, like many others, it portrays late-night snacking as a terrible habit we need to get rid of. I don’t think of it that way at all! 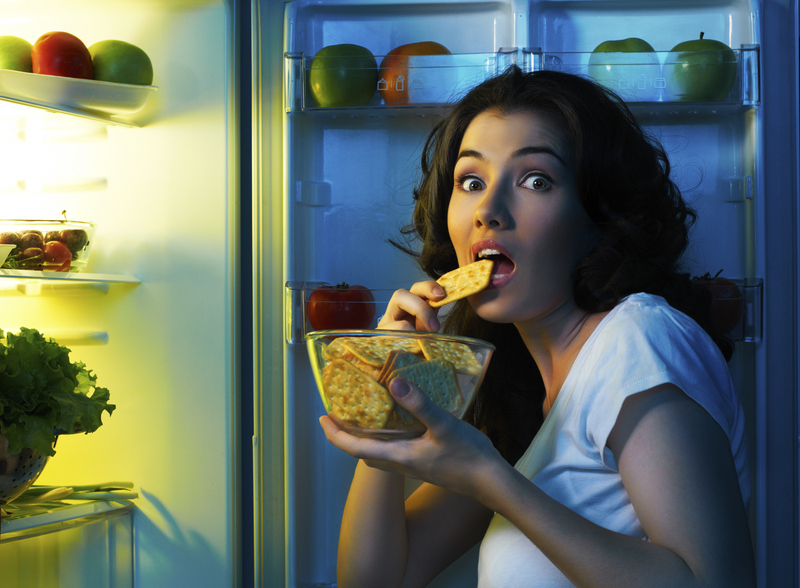 I’d really like to know if it’s actually been proven that late-night snacking causes weight gain. Maybe it does, and I’ve just never noticed! I also have seen diet tips that warn against eating at night and never fully understood why either. I did a little Googling and basically saw that the reason eating at night is said to be bad is because during the day when you consume calories, you are able to burn most off either through exercise or just normal activity. When you eat late at night and then go to bed, your body is unable to burn off the extra calories therefore all of the calories are absorbed and end up leading to weight gain. I wanted to read this article because I am a sucker for late night craving and that is always when I eat the most, so I was hoping that this would show that it would effect late night. I think the bigger problem about this phenomenon is not the time of day people are eating, but that late at night people tend to crave fattier and higher calorie foods. I have a bad tendency to eat dinner early. By the time it hits 10:00 at night, I am already hungry for another meal. I limit myself to a small snack because we all know that it is difficult falling asleep hungry. I always wonder if eating before I go to sleep will make me gain weight, therefore, I was very intrigued by your blog. You presented both possibilities, which made it hard for me to decipher whether it was good or bad. Ultimately, you stated how a proper conclusion was not found. Personally, I feel that the inactivity of going to sleep and eating a meal right before does not allow your body the time to work off the calories. Therefore, I personally hypothesize that you can gain weight eating before you go to bed. You said you were curious about the types of food the studies were relating to, so here is an article with five foods you should not eat before bed, as well as healthier alternatives to each! I found this article very interesting because i thought that your metabolism slowed down at night and that is why you gain weight eating a night. Your blog didn’t mention anything about your metabolism slowing down and i did a some research to see if this was true. I found this article that says it doesn’t matter what time of day you eat but rather what you are eating at night like your blog said. As someone who is constantly fighting the pull of the snack drawer late at night I have always wondered the actual health affects of night snacking. My family has always tried to follow the rule of no snacking past 10pm. As a child and even a high school student I never really questioned their motives, I just assumed that they were right in the fact that eating that late can lead to undesired weight gain, more so than snacking during the day. Now I know not to just follow blindly, so like you I took to the internet to do some research of my own. According to WebMD they too stated that a calorie is a calorie no matter the time consumed. The true determinant of weight loss or gain is how many calories you are burning with daily activity. The article does discuss an experiment conducted at Northwestern which published the results stating that night-time eating lead to twice as much weight loss. This experiment however was only conducted on mice. However they do discuss the differences in motivation behind the snacking when eating at night and how they are more boredom or stress driven, not hunger driven. Relating to the fact that the snacking may not be as controlled as during the day, which may lead to bigger portions consumed and therefore more weight gain. These are just theories however, and if you wish to learn more visit http://www.webmd.com/diet/features/diet-truth-myth-eating-night-causes-weight-gain#1. Eating late at night and weight gain has always been something that I wondered whether or not it was true. The two different articles that you compared both seem valid, which just makes me wonder even more which conclusion is correct. Like Justine said in her comment, I have also heard that eating right before bed can cause weight gain because no calories are being burned off. I still wonder whether or not that hypothesis is true? Here is a link to a study that was conducted on mice related to weight gain and late night snacking. I am not sure if this is true but I believed that eating at night would lead to weight gain due to the fact that you are not burning the calories by moving. At night, you usually may eat a snack and go straight to bed, and then those calories will not be burned off. I am not sure if that is a myth or not but I figured that I would give my input into why people tend to gain weight if they eat at night. Unfortunately, I am always eating late at night due to OrderUp and the late night food delivery services on campus. Here’s an article I found about why late night eatingy can be detrimental to your health. I am not sure if this is true but I believed that eating at night would lead to weight gain due to the fact that you are not burning the calories by moving. At night, you usually may eat a snack and go straight to bed, and then those calories will not be burned off. I am not sure if that is a myth or not but I figured that I would give my input into why people tend to gain weight if they eat at night. Unfortunately, I am always eating late at night due to OrderUp and the late night food delivery services on campus. Here’s an article I found about why late night eating can be detrimental to your health.